Ken Holland addresses Steve Yzerman speculation. Brad Galli has more. 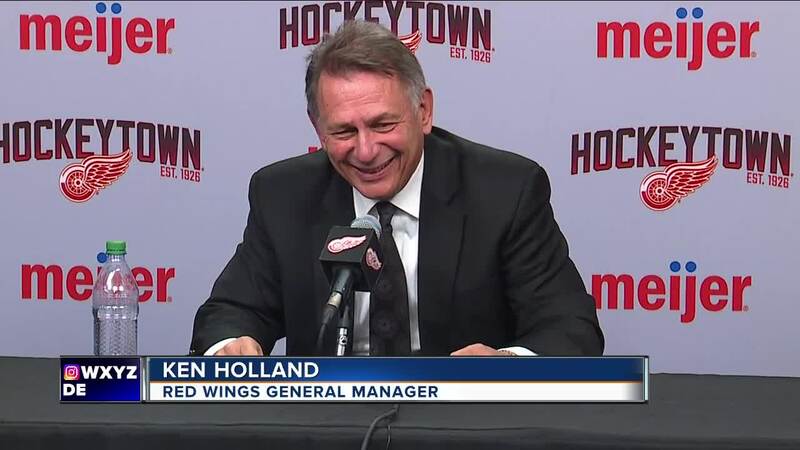 DETROIT — Ken Holland said he'd have to live in a cave to ignore the rumors and reports about his future in Detroit, and the speculation Steve Yzerman is returning to work for the Red Wings. “I’m going to the the manager of this team until I’m not the manager of the team,” Holland said on Monday. Past that, the Red Wings general manager wouldn't discuss his future. Yzerman stepped aside as Tampa Bay's general manager last fall. Since that point, many in hockey have been waiting for his next step. There's a strong belief it could be with the Red Wings, as Yzerman maintains a home in the metro Detroit area. Holland has one year left on his most recent contract. He called Yzerman a friend, and detailed their relationship. “You remember how you have those best friends in high school and then you all go your separate ways? You see each other 10 years later, and all of a sudden you reconnect? You don’t miss a beat. Steve Yzerman and Ken Holland don’t miss a beat. Jim Nill and Ken Holland don’t miss a beat. Mike Babcock and Ken Holland don’t miss a beat. Those guys are all friends of mine," he said.